The Bill of Rights Defense Committee has an open letter to Tell the Senate to restrain executive power which we couldn’t advocate signing enough. This broad issue is the foundation affecting so many more of the central issues of our time, and the Senate Judiciary Committee should consider it with the upmost urgency as they debate confirming Elena Kagan to the Supreme Court. Regardless of who stands before your committee, we encourage you to vigorously examine any nominee to the Supreme Court, with a particular eye towards establishing his or her willingness to check and balance the Executive Branch when necessary to protect constitutional rights. Areas of constitutional doctrine that have particularly suffered in the past decade include the First Amendment rights to freedom of association and speech, as well as religious free exercise; the Fourth Amendment rights to freedom from unreasonable searches and seizures; the Fifth Amendment right to due process; the Sixth Amendment’s assurance of trial by an impartial judge before a jury of one’s peers; and the Fourteenth Amendment’s commitment to equal protection under the law. Any nominee’s views of each of these doctrines should be carefully considered before granting a lifetime seat on the nation’s highest court. As usual, we have another fantastic call today, building off the energy from our last call focusing on the “who” we will engage, while this time discussing the “how” in much more detail. Mark discussed the problem of having disparate efforts between many civil liberties organization with far too little connection between them. There is a need to connect these groups along a “21st century civil rights agenda” as he put it, which is a framing that I am particularly a fan of! Following up on Mark’s point, we discussed how the Computers Freedom and Privacy conference may be the perfect venue to built such a coalition. Get FISA Right will have a presence during a session on online activism, and there are also various potential working sessions and an unconference which we are discerning how we can best be involved in—with a focus of coming out of it with tangible progress. An impromptu discussion followed up from Wolf based on the role of religion within what is going on today, as I described my conversations with my Rabbi (I had given him a copy of The End of America, and it impacted him as it likewise impacted me), and Mark emphasized how Joe Lieberman’s effort to strip Americans of their citizenship is particularly anathema to the lessons from the Holocaust. I emphasized further how, today, it appears Jews have forgotten the true lesson within our wide-spread clarion call of “Never Forget” in relation to the Holocaust. Shahid as well cited his Muslim faith’s impact on these issues for him, amidst his larger desire to continue these important, and all too rare, conversations while further relaying them in writing. Per a suggestion from Thomas, we discussed Elana Kagan’s Supreme Court nomination and potential GFR actions in response. Thomas suggested utilizing Leahy’s letters, as they are potentially a visible demonstration of Kagan’s “unitary-lite” thinking. He further cited how Larry Lessig defended it to Glenn Greenwald in a fantastic bloggingheads.tv discussion. Shahid also mentioned BORDC’s upcoming activism on Kagan, which Get FISA Right will be proud to support. We finished the call with a discussion of logistics, as we want to make sure to have something we can laucnh with a media release at CFP, concluding that a call within the next two to three weeks would be prudent. Thanks to Mark, Jon, Korkie, and Shahid for joining the call, and for Thomas joining in on the chat! Much progress was made, further getting the ball rolling on some exciting initiatives that will lead to a much higher level of progress as well. Our next organizing call and online chat is Tuesday, May 18 at 12:30 PST / 3:30 EST, and please join us in the meeting page to suggest goals, agenda items, or to just ensure your voice is heard! We’ll be building off our last call, and pushing forward on determining how we can best coordinate with the BORDC on their local ordinance campaign as well as making ground on how we will be taking part in this year’s Computers Freedom and Privacy conference. Jon brought up engaging in the upcoming Computers Freedom and Privacy conference (which he co-chairs), and suggested an online hour long brainstorming session during it in order to reach out more broadly. Moreover, Shahid will be there as well, so hopefully it will represent an opportunity to brainstorm around coordinating on their model ordinances campaign as well. Mark discussed the webcast on OFA David Plouffe and Mitch Stewart where they emphasized the importance of face to face discussions to get out the vote. We all found ourselves in agreement in this regards, and view the goal as merging the in person with the social networking to be “really cooking with gas” as Jon put it. The discussion of OFA strategy, especially their targeting of first time voters amongst young people, African Americans, and Latinos, made way into our analysis of the Tea Party, which does largely fall outside this spectrum being largely older and white. However, Sally brought up how she is a policy person over a party person, and many on our call (and our constituency at large) seem to have a similar foundation in the issues at hand rather than the particular political vehicles to getting there. Before we lay any groundwork for expanded engagement, however, we do need to discern what we are engaging around and who we are trying to engage with, along with a clear message of what we want people to do. This is a turn, as a focus on Democratic primaries would not jive with this aspect of a transpartisan strategy, but BORDC’s model ordinances campaign could be a sweet spot. We further assessed the specifics of the ‘who’ for our engagement, reaching clear agreement that Ron Paul Libertarians seem to be natural allies for us. We debated a more expanded outreach amongst the Tea Party set, and Ben did report that he received a positive response when he took his ‘stop government spying’ sign to a Madison Tea Party rally. However, the key comes down to who we can work with in good faith, and there was disagreement in regards to how deep Fox News’ and the GOP’s control of Tea Party is, and how mitigating it can be for coalitioning. Jim mentioned that he had a contact who was amongst the original modern Tea Party members who dumped tea (at least for show) into the Boston Harbor in 2007 as part of the Ron Paul campaign, and he offered to reach out to them. I broached the fact that there was fantastic conversation occurring all over the email list, and that many of those kinds of posts could easily be turned into blog posts. If anyone does want to have their words put in a more permanent location, I have an open invitation to send me material (or work with me however you wish) to get it out there with full attribution, especially since the public nature of a blog makes connecting with those outside the closed architecture of our email list that much easier. On top of that, there were suggestions of commenting in the blogs of organizations like Ron Paul’s Campaign for Liberty in our own names and identifiably as GFR members (providing that we do so level headedly), while also attempting to guest blog in such forums as well. Jim, Sally, and Mark have plans to follow up on a blog project that could combine these strategies. Thanks to Sally, Mark, Jim, Ben, and Jon for joining the call! 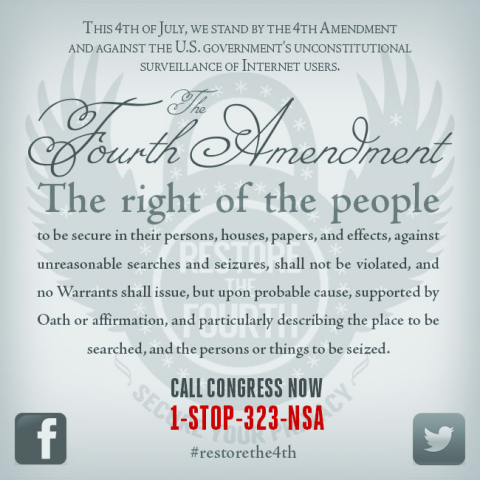 We’ll be holding our latest Get FISA Right conference call and online chat May 4 at 6 pm PST. Here is the meeting page, and if you can please say hi in the chat and/or provide any ideas you have for goals or agenda items! Energy has been very high on our Organizing for America (previously MyBarackObama.com) email lists, and it bodes for quite a call to harness that passion as we strategize for the fight ahead. You are currently browsing the Get FISA Right blog archives for May, 2010.